Tampa Bay Downs will have nine races today with first post of 12:28 p.m. 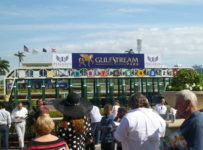 The feature is the ninth race, a $23,000 allowance at a mile on the turf for fillies and mares 3-years-old-and-up. The morning-line favorite at 2-1 is the 4-year-old filly Babe’s Ruler, who was claimed from her previous start, a victory at Tampa Bay Downs on Dec. 5, by trainer Jamie Ness for his Jagger, Inc., stable. Antonio Gallardo is slated to ride. Fast Flying Rumor, at 13-1 odds, beat Wild Woo Who by 1 ½ lengths in Friday’s feature at five furlongs on turf for 3-year-olds and up. It was a $100,000 allowance/optional claimer with a $28,000 purse. Tampa Bay Downs billed it as the Turf Dash Prep because many of the horses are expected to come back for the $100,000 Turf Dash at Tampa Bay Downs on Jan. 9. Fast Flying Rumor sat off a blazing early pace before rolling past the even-money favorite Rivzinthehouse on the turn and holding off Wild Woo Who. Fast Flying Rumor was ridden by Ronald Allen Jr. and won in 55.72 seconds on a course listed as firm. Rivzinthehouse finished third, a head behind Wild Woo Who. Gerald Bennett trains Fast Flying Rumor and his Winning Stables owns the horse in a partnership Winning Stables in partnership with Midnight Rider. Inkling, the likely favorite, was scratched early in the afternooo by order of veterinarians. Fast Flying Rumor won the June 14 Select Stakes at Monmouth Park at five-and-a-half furlongs on the turf before three consecutive sub-par efforts that resulted in a three-month break from competition. $2 EXACTA 4-6 PAID $145.00; $1 TRIFECTA 4-6-3 PAID $211.90; $1 SUPERFECTA 4-6-3-8 PAID $681.50; $1 SUPER HIGH FIVE PAID 4-6-3-8-5. 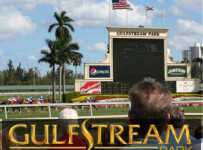 NOTE — photo on home page is the Tampa Bay Downs walking ring, taken by Barry Unterbrink. Editor Jim Freer has covered horse racing for 15 years during his career as a journalist writing about business and sports in South Florida. He was previously the horse racing correspondent for the Miami Herald and the Florida correspondent for Blood-Horse. Jim contributes to other racing publications and is a regular guest on industry radio and podcast shows for WDBFradio.com and espn.com. He manages editorial content for HorseRacingFla.com.